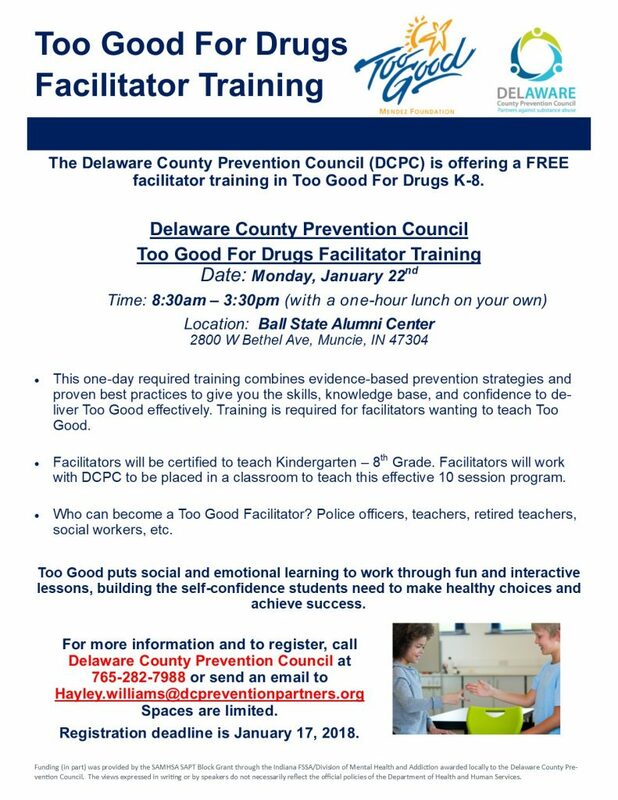 Delaware County Prevention Council (DCPC) will be offering a FREE Too Good For Drugs Facilitator Training on January 22nd. Facilitators will be certified to teach Kindergarten – 8th Grade. Facilitators will work with DCPC to be placed in a classroom to teach this effective 10 session program. All Facilitators must complete this training in order to teach this program. For more information and to register, call Delaware County Prevention Council at 765-282-7988 or send an email to Hayley.williams@dcpreventionpartners.org Spaces are limited. Registration deadline is January 17, 2018.